Mr. José Luis Rubio is the Deputy President of the World Association of Soil and Water Conservation (WASWAC), Vice Chairman of European Soil Bureau Network-ESBN (JRC, EC), Immediate Past President of the European Society for Soil Conservation (ESSC), the Chief of the Department of Soil Degradation and Soil Conservation at CIDE (CSIC, Universitat de Valencia, Generalitat Valenciana). Centro de Investigaciones sobre Desertificación-CIDE (CSIC; UVEG, GV). Carretera Moncada-Naquera km 4,5 Apartado Oficial, 46113 Moncada (Valencia). Spain. E-mail: Jose.l.rubio@uv.es. Abstract: [Objective] The basic approaches in soil protection in burned forest areas were discussed in order to expound the emerging field of bioengineering applied to soil restoration and stabilization, to soil protection against different types of erosion, in the maintenance of landscape quality and in terms of biodiversity and aesthetic values. [Methods] This study was conducted by reviewing and evaluating the current techniques of bioengineering applied to soil conservation and restoration after forest fires in Spain, setting out some basic principles and describing a few successful examples of applications in various areas affected by forest fires. [Results] The key part of the fundamentals of bioengineering applied to conservation and restoration of soils is based on some traditional principles of soil conservation, especially in regard to the ecological coherence with the specific site of intervention and the use of simple techniques. Also we should not underestimate the role of more recent techniques of civil engineering. These techniques (e.g. use of gabions) are subjected to a process of introducing a greater role for the biological elements (mainly plant materials) which are the main actors in stabilizing the soil in relation to the climate and biophysical characteristics of the area of intervention. Along with living materials, various biomaterials such as plant residues, cut bushes, lignified elements and the wide range of geotextils are also used. 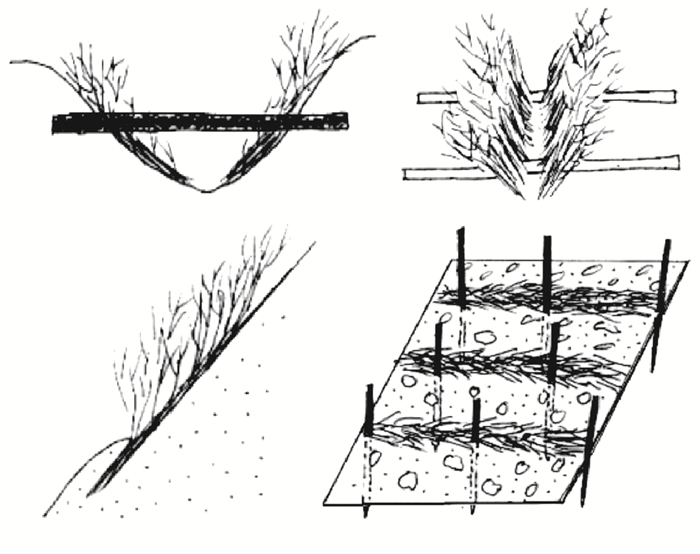 These techniques are gathered into four main groups: ① techniques to protect soil, ② stabilization of the ground, ③ combination of reconstruction techniques, and ④ additional stabilization techniques. [Conclusion] Bioengineering applied to soil conservation provides a more environmentally tailored approach that promotes more efficiency in the long term. It also shows advantages in aspects such as its low cost, better adaptation and benefits of multifunctional landscapes. Nevertheless, it includes some important drawbacks such as manpower requirements and the lack of knowledge and availability of suitable plant material, especially in areas of dry climate conditions. Despite these difficulties, bioengineering is an emerging, promising and fast growing applied technique for the new demands on soil protection in the cases of emergency interventions after forest fires impacts. The emerging field of bioengineering applied to soil and water conservation offers important options for initiatives of soil restoration and stabilization in the context of land management developed under more environmental friendly principles. In the last decade, forest fires have increased at alarming rates. There were many dramatic forest fires occurred in the summer of 2018. The area of burned land is about 600~900 million ha per year in the current world, it could emit 2.5 Gt of C(carbon) to the atmosphere yearly, which is equivalent to 30% of global fossil fuel/industrial emissions. Therefore, it is very important to be aware of climate change which is coincident with an increase in the incidence of forest fires and their impact on soil and hydrological resources. A pressing question is what should we do after fires to protect and restore our soils? The answer is complicated owing to the following factors: ① It is a controversial subject with diverse visions; ② There is a wide environmental and impact heterogeneity; ③ We lack clear choice of what it is wanted for the post-fire zone; ④ Sometimes it is not clear for the assumption of agreement on protection, ecological restoration, ecosystem services and prevention. Soil protection in burned areas should be part of a broader watershed restoration context applying functional and landscape criteria. For the term restoration, we understand the set of actions that allow restoring the composition, structure and function of the ecosystem. It is therefore a complex multidisciplinary process with strong initial emphasis on soil protection aspects, continued with actions in the medium to long term that will enable the affected burned zone, to regain its self-regulating natural dynamics capacity being integrated in the context of the overall biophysical and climate characteristic of the region. In a broader context, it also includes the increasingly tendency to highlight and promote the goods and services provided by the forest in the maintenance of biodiversity, landscape quality, water cycle regulation, regulation of greenhouse gases and protecting soil[1-2]. Traditionally soil protection in burned areas has followed methodological schemes based on the principles of forest hydrological correction (Ministry of Environment, 1998). These restoration techniques include classical approaches to soil conservation initially developed in the United States and extended with modifications and adaptations to the world, including Mediterranean environment[3-6] (FAO, 2000). However, current soil conservation schemes should be expanded to include new perspectives in the broader context of sustainable use of terrestrial ecosystems. Therefore, the basic approaches in soil protection in burned areas are discussed in this paper, which includes options that the emerging field of bioengineering offers to soil restoration and stabilization, to the protection against different types of erosion and in the maintenance of landscape quality and in terms of biodiversity and aesthetic values. The general objectives of soil conservation in burned areas are part of the actions of forest hydrological correction which in turn are specified in a number of sub-objectives such as the maintenance of the productive capacity of the soil, decreasing the intensity and effects of catastrophic floods, protecting reservoirs against sedimentation, improving hydrological regime and protecting the water quality. The specific soil conservation measures can be distinguished into the cultural or preventive mea-sures and the protective measures. The preventive measures, by simple soil management techniques, aim to improve soil properties (structure, organic matter content, infiltration), proper management of vegetation, hydrological monitoring and management (runoff, permeability, drainage, erosion). The common preventive measures include grazing control, stubble treatments, organic fertilization, plant protection, surface machined work, mulching and maintenance of green covers, etc. Meanwhile, the traditional preventive measures can vary widely depending on the enormous complexity and diversity of forest environments. The complicated topography, soil distribution and climatic conditions open a wide field of application of varied techniques which however can be grouped roughly into five types. These groups include cultivation levelling, strip cropping, terracing, bench terracing and the building drainage channels. The main objective of these techniques is to reduce the volume of runoff and to control soil erosion. In USA, there is extensive experience in its use as rehabilitation techniques of burned watersheds[8-10]. These techniques are extensively described in the manuals and soil conservation techniques and they are complemented with techniques of restoration of watershed and fluvial ecosystems and correction of torrential channels. More recently, some of these actions have been controversial and there is an increasing consideration to new approaches with less impact or more adapted and integrated to the burned ecosystem. These new approaches range from the minimal intervention to the approaches to support the ecological succession, that is taken as a starting point of the current structure and reinforcing it with interventions highly adjusted to the succession. Once past the critical early stage of post fire, the silvocultural management is also oriented in this direction. It pursues, with appropriate forest treatments (thinning, pruning, resalveos, clearing), that the emerging vegetation cover will continue modeling natural stands and avoid deviation trends such as increased density of trunks and the phenomena of competition. Within these new designs adapted to ecological succession, it is included bio-engineering approaches. Bioengineering techniques applied to soil conservation offer interesting possibilities in restoring burned areas. The social demand for the maintenance of biodiversity, regulation of the carbon cycle, maintenance of landscape quality, water cycle regulation and prevention of land degradation, requires new approaches with large multifunctional and multidisciplinary criteria. These aims should be met without losing perspective of the essential aspects of the previous schemes, including soil protection, maintenance of soil fertility and soil-water interaction. Bioengineering is part of the broader ecological engineering or ecotechnology and has been the subject of extensive discussions and numerous conceptual definitions. One of the most synthetic considers that environmental technology is simply "managing nature". For Straskaba, it is "the use of technological measures for ecosystem management, based on a deep ecological knowledge to minimize the cost of interventions and their impact on the natural environment". A third definition is "the proactive design of sustainable ecosystems, which integrate human society in its natural environment for the benefit of both". In this context, bioengineered soil protection (land bio-engineering) can be considered as a set of techniques that, for one part, are oriented to the restoration and creation of terrestrial ecosystems (ecological engineering) and, secondly, to its management and protection (environmental technology). Traditionally, the stabilizing role of vegetation on hillsides, slopes and embankments has been generally accepted by empirical experience and data. Although reforestation with various plant species for erosion control has centuries of history, researches on the effects of vegetation on soil stabilization in unstable areas only started from the 1960s. It is considered that, broadly speaking, its effects can be grouped into hydrological and mechanical effects. We should also consider the biological effects although these generally end up manifesting through the first. Among the hydrological effects, it would be found that the rainfall interception, on the one hand reduces the impact of rainfall and on the other hand increases infiltration and subsurface flow. The water absorption by the roots, also results in a positive effect by decreasing the water pressure in the pore volume. As a negative hydrological effect increased evapotranspiration would be found, with the effect of decreasing excessive soil moisture. Among the mechanical effects, an important one is the soil strengthening by the roots, which increases the shear strength. This mechanical reinforcement varies widely depending on the characteristics of the soil profile and even, in certain circumstances, prevents the formation of slip planes. In this sense, the weight overhead representing vegetation cover on a slope, may increase the effects of shear and water pressure in the soil pores. This effect can be increased by the overloading of the wind. However, provided that the inclination of the slope is not excessive, the overweight due to vegetation, increases stability. Bioengineering applied to the restoration and conservation of soils includes methodological aspects and principles of action coming from the most traditional and conventional soil conservation techniques. It also incorporates various engineering techniques such as the use of gabion, geotextiles or tights. However, this is incorporated under an integrated approach that pursues the development of effective, economical and environmentally acceptable soil protection techniques. Its novelty lies in the priority given to the use of plant materials and drastically reducing the use of harsh elements, more applicable to the civil engineering. These are not discarded depending on the circumstances and are usually used in the initial stages of intervention, but the purpose is their progressive incorporation and coverage by biotic elements. Ecological coherence within the possibilities and limitations of biophysical and climatic zone and by type of action is pursued. In the final stages, it is the incorporation of special living plant to perform engineering functions but all under a tailored design to ecological succession. The functions of vegetation in bioengineering can be grouped into four major groups. ① Soil protection techniques, which could quickly protect soil, by the effect of surface coverage against surface erosion and degradation. These techniques improve water retention and increase the biological activity of soil. ② Soil stabilization techniques that reduce or eliminate the negative mechanical effects arising from the weight of soil mass. Stabilize unstable slopes by root penetration, lowering the air pressure in the pores and increased drainage. ③ Combined restoration techniques, which stabilize unstable slopes or river banks by the combined action of living plants and inert materials (stone, concrete, wood, steel and geotextiles). ④ Additional stabilization techniques that use seeding and plantations to ensure the transition between the initial stages of operation to the completion of the intervention. There are already many successful stories which used bioengineering techniques for soil conservation after wildfires through the world. I will just mention three efficacious case stories in Spain. ① Bioengineering soil conservation for prevention of water contamination after forest fires(Cordoba, Spain forest fire July 2007; Ruiz, et al., 2008. ), which prevented the contamination by sediment of the water reservoirs for sweet water use in the big capital of Cordoba. ② Bioengineering soil conservation for prevention fisheries/moules damage after forest fires (Galicia, NE Spain August 2006, and July 2016; De la Fuente and Blond, 2008.). The rapid and selective and successful intervention of bioengineering in the most sensitive areas for sediment delivery prevented the contamination and damage of fisheries. ③ Emergency post-fire interventions in Aragon (NE Spain), where is sensitive to erosion and with self-regeneration difficulties. The emergency work plan includes evaluation of fire damage and effects, prioritization of actions, removal of burned wood, soil protection measures, treatments of survival stands from pest attack, improvement of habitats and wildlife support, and evaluation of natural regeneration and repopulation. (A. Hernandez Jimenez, 2012.). In considering approaches related to the conservation and restoration interventions of burnt areas, apart from the above classification, there are specific techniques to apply which are continually evolving. Among them may be mentioned the use of barriers trunks and branches of trees burned, air seeding, the use of organic blankets and blocks, bio-cylinders and degradable materials. Fig. 1 shows a diagram of the branch layering in gully protection. The materials used in the project are long and strong living branches of rooting plants (for gullies deeper than 1.5 m, very bushy branches can be used). Cross beams should be placed at a distance of 2 m, with length and thickness depending of the gully. This technique is used to repair shallow gullies (no deeper than 3 m and no wider than 8 m). Living branches root can secure the gully bed. Well rooted branches can withstand temporary flooding. Silt should not cover more than a third of the annual growth of the branch. On the one hand, it provides continued effectiveness through the use of living plant material; on the other hand, it has the following disadvantages: slightly more expensive than dead branch layering of gullies, it cannot cope with continuous flow, cannot be applied if severe bed load and shoulder movement with significant deposition is expected. There are other effective techniques, such as using airplanes to spread straw to get high land cover quickly, and covering bare land by spread slash. These measures are the same with planting trees and grass(shown in Fig. 2), which are designed to increase ground cover, and to prevent soil loss after fire. The use of plant species in bioengineering techniques raises a wide casuistry which involves many factors to consider. These include the choice of species and their origin, site preparation and machinery, the specific activities of sowing and planting, subsequent maintenance and the additional work necessity. The choice of species is a particularly critical aspect because much of it is going to be depended on the success of the restoration intervention. The situation is better in humid climates than in semi-arid climates or dry sub-humid, in which the range of options and chances of survival are lower. There is an extensive literature on botanical species best adapted to each bioclimatic zone. In general the criteria for the choice of species includes ecological factors (phytogeography, climate, lithology and soil and physiographic), economic factors (availability, source, cost, transportation), and other factors such as the availability of labor or the knowledge of plant succession. As for the selection of individual performance techniques in each case, it gradually increases the information available. Specifically, in the framework of the EU project, "Eco-engineering and conservation of slopes for long term protection from erosion, landslides and storms-ecoslopes"(QLRT-2000-00289), we conducted a review and evaluation of the principles and characteristics of the available techniques of bioengineering applied to soil conservation and soil restoration. In this context, Andreu et al developed a collection of techniques indicating each case of the purpose, usage, methodology, materials used and their advantages and disadvantages. Bioengineering techniques applied to soil conservation and restoration of burned-protection zones provide a more environmentally adapted and consistent approach with plant succession, the maintenance of biodiversity and the preservation of the ecological functions of the affected areas. This increased environmental coherence favors greater long-term efficiency. Many of these approaches and specific techniques are of particular interest in the actions of post-fire protection. They also provide economic benefits for its lower cost and improve the landscape and visual quality of interventions. These general approaches, in tune with the natural limitations and possibilities of the target area, increase the range of multifunctional benefits, which are not limited to the perspective of civil engineering. They have, however, a number of drawbacks and disadvantages such as the need for skilled labor, lack of knowledge and availability of suitable plant species and its availability at any given time. Despite these drawbacks, bioengineering techniques are positively perceived as emerging and promising approaches that are also showing rapid growth and acceptance. In the last decades forest fires have increased at alarming rates. Climate change trend will likely escalate forest fires threat. Society and the environment are demanding new strategies on soil protection, environmental restoration and prevention based on efficiency, innovation and ecological principles. It is needed of a more self-protected, resilient forest, adapted to the ecological succession and contributing to the mitigation of climate change. We should improve societal perception of the consequences of wild fires for the biosphere and the human environment. It is a formidable threat, but otherwise a formidable opportunity for an integrated, innovative and imaginative response of the research and academic community. Burning nature is burning the future. Not accepting the unacceptable, our commitment should be to try to guide knowledge and push the move to action. Lindenmayer D B, Margules C R, Botkin D B. Indicators of biodiversity for ecologically sustainable forest management[J]. Conservation Biology, 2000, 14(4): 941-950. Stuart Chapin F, Mooney H A, Matson P A. 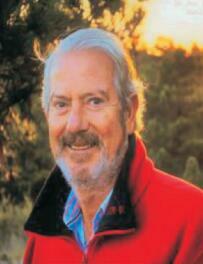 Principles of terrestrial ecosystem ecology[M]. New York: Springer, 2002. Bennet H H. Elementos de conservación del suelo. Fondode Cultura Económica[M]. México: Fondo de Cultura Economica, 1965. Fournier H. Conservación de suelos[M]. Mundi Prensa: Consejo de Europa, 1975. Magister Hafner M. Apuntes de conservación de suelos[C]//Tomo Ⅱ. Universidad Politécnica de Madrid. ETSI Agrónomos, 1991. Tragsa. La Ingeniería en Los Procesos de Desertificación[M]. Mundi Prensa: Consejo de Europa, 2003. Rubio J L.Soil threats and soil protection. The role of biotechnology[C]//The Third International Meeting on Environmental Biotechnology and Engineering. Palma de Mallorca, Spain, 2009. Heede B H. A study of early gully-control structures in the Colorado Front Range[C]//Station Paper 55. Fort Collins, CO. U.S. Department of Agriculture, Forest Service, Rocky Mountain Forest and Range Experimental Station. 1960. Baley R W, Copeland O L. Vegetation and engineering structures in flood and erosion control[C]//Proceedings, 13th Congress International Union of Forest Research Organization, Vienna, Austria, 1961. Noble E L. Sediment reduction through watershed rehabilitation[C]//Proceedings of the Federal Inter-Agency Sedimentation Conference 1963. Washington, DC: U. S. Department of Agriculture, Misc. Pub, 1965-1970: 114-123. Rubio J L. Bioengineering technologies for soil conservation and soil restoration[M]//Technologies of Waste Disposal and Soil Protection. Zadar, Croatia: Akademia Tehnickih Znanosti Hrvatske, 2009. Odum H T. Environment, Power and Society[M]. New York: Wiley Interscience, 1971. Straskraba M. Ecotechnology as a new means for environmental management[J]. Ecol. Eng, 1993, 2(4): 311-331. Mitsch W J. Ecological engineering: A new paradigm for engineers and ecologists[M]//Schulze P C. Engineering within Ecological Constraints. Washington DC: National Academy Press, 1996: 111-128. Norris J E, Stokes A, Mickovski S B, et al. Slope Stability and Erosion Control:Ecotechnological Solutions[M]. Dordrecht, the Netherlands: Springer, 2008. Andreu V, Khuder H, Mickovski S B, et al. Ecotechnological solutions for unstable slopes: ground bio-and eco-engineering techniques and strategies[M]//Norris J E, Stokes A, Mickovski S B, et al. Slope Stability and Erosion Control: Ecotechnological Solutions. Dordrecht, the Netherlands: Springer, 2008: 211-275.